The Horseshoe Pool at Decoy really hit top form on Sunday for the JVAC lads. Matchwinner Chris Saunders topped a strong field with a huge 163lb 14oz net of carp to double figures from peg 13 with every fish falling to cat meat fished close in. Runner-up from peg eight was Paul Faulkner. He started on a small feeder and caught well before switching to the margins late in the match fishing dead reds over micro pellets for 97lb 5oz. Next came Andy Gausden from peg one with 76lb 8oz. It’s a big weekend coming up for the JVAC lads as they once again start their quest for a place in the Angling Times/Knockout final. In the first round they take on a strong Westwood Lakes side on their fishery at Boston. Lou’s Lake on the Decoy complex was the venue for the latest Hotpoint AC fixture, but with the lake in desperate need of water, margin fishing was always going to be a real test. In fact the whole day was tough for most due to the dramatic change in the weather overnight with temperatures dropping into single figures after some beautiful spring days leading up to the match. Most started on a small feeder approach but only matchwinner Vince Stapleton managed to keep the fish coming on the method for the whole of the match. Drawn on hot peg six, he made no mistake catching carp to 6lb on a small Method feeder with either pellet or sweetcorn on the hook to record a fine 164lb 14oz. I was hoping to make it back-to-back wins but drew peg 11 and finished a long way behind the winner in second place with 63lb 13oz. Third was Tyrone Horn (54lb 3oz). There was a smaller than expected turnout for the Decoy Open on the Beastie Lake which ensured all those fishing had plenty of room. 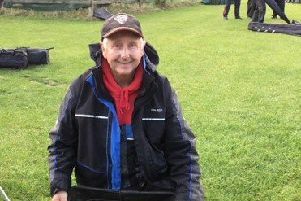 Paying his first visit to the fishery for some time was Tony Watling (Senior). He put together a very impressive 168lb 1oz net of carp, F1s and skimmers from peg five fishing a short line with maggot. Second from peg 22 was Ashley McLeish, who fished the long pole with maggot and then in the margins with pellet for 165lb 10oz. 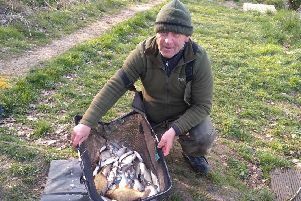 Dave Whiting came in third fishing the pole with pellet close to the bridge on peg 18 for 138lb 11oz. The Beastie Lake was the venue for the Friday Over 55s match which saw Oundle rod Nigel Baxter on peg 22 take the honours with 88lb 1oz F1s carp and skimmers. He fished the long pole with expander pellet over micros. Second was Steve Dorks on peg nine with 78lb 8oz and third Chris Saunders with 74lb 4oz from peg 18. Ramsey AS fished the Yew Pool on Sunday and it was the high number pegs that made the frame. Top rod with 104lb 12oz was Andrew Wilding on peg 27. He caught on a feeder for most of the day. Second with 93lb 2oz on peg 23 was Liam Darler then came Andrew Rayment on 86lb 12oz followed by Mark Williams on a level 86lb. A special mention has to go to Simon Wagstaff. He drew out of the hot pegs on peg 16 and struggled to catch a single carp all day. But he did finish with 84lb 12oz, all barbel caught on maggot.